An ambitious project, L’oscar London has seen the conversion of an Historic England ‘at risk’ Grade II* listed building into an award-winning hotel, with 3 full floors added and a painstaking internal and external renovation, sensitive to all its heritage elements. Two years into the build, Recept was appointed as consultant and Contract Administrator and it worked closely with the client to restructure the building contract and the site team to provide a platform for completion. Since late 2015 Recept has overseen and monitored the project, working closely with its appointed project manager and providing support to the hotel operation team, to transition from building project to trading hotel. · Liaison with planning consultants, preparation of the Travel Plan and co-ordination of the Sustainability Plan and BREEAM certification process. · Management of the client side consultant team including MEP, Structural and QS along with a number of client direct contractors including kitchens and door access. In 2011 Stephen was responsible for the installation of approximately 33,000 sq.m of solar panels, including 3 Thames Water sites with a nominal capacity of 4 Mwp and a value in excess of £12m. At one time, the installation at Walton on Thames was the largest PV installation within the the M25. The 6 projects were completed in 4 months and the installations were maintained by us until their disposal by the investor in 2017. In 2009, Peter Clarke undertook a consultancy for Lloyds Banking Group to assist the bank in preparing a five year plan, and to assist in the planning and set up of asset and transaction management systems, for the Real Estate Business Support Unit. The four month consultancy also involved providing advice on the set up of the BSU’s Solutions Team who would provide transactional and asset management advice to the unit. Whilst Executive Officer of British Land, Peter Clarke introduced an innovative new partnership approach to corporate responsibility. 'Building Together' created a successful partnership between the company, its customers, suppliers, employees and local communities to change the way that the business engaged with its stakeholders; and responded to a changing financial and regulatory environment. Adopting this new approach led to significantly increased 'buy in' as to the benefits of Corporate Responsibility, embedding it within the business and aligning it with British Land's strategy.Customer satisfaction increased from 40% in 2005 to 82% in 2009. Energy use was cut by 12% in 2009 with 86% of waste was diverted from landfill. 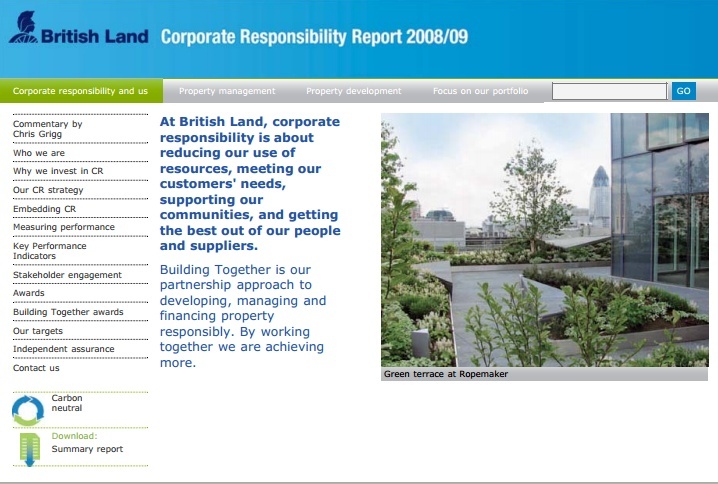 British Land was the Real Estate Sector Leader in the Oekom Corporate Responsibility Review 2010 and one of the Global 100 Most Sustainable Corporations in 2009.